SnapCacklePop: Years & Years deliver one of best albums of 2015..! 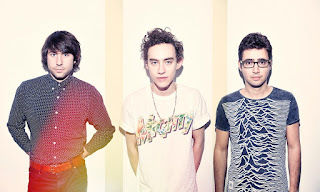 Years & Years deliver one of best albums of 2015..! Now some pop fans may say we are a bit slow on the uptake here, however we are now jumping on the Years & Years bandwagon with both feet. Whilst on holiday in the UK recently, SCP became hooked with this Synthpop electronica house sound and urgently need to promote in Australia the awesomeness that is this British bands debut album Communion. The band consisting of frontman and keyboardist Olly Alexander, bassist Mikey Goldsworthy, and synth player Emre Türkmen, take elements of electropop, 80’s Synthpop, R&B and 90’s house and turn it on its head into something that is current and new. Just listen to single King and you’ll get what we mean. The songs reflect times of heartbreak and loneliness and showcase the great songwriting abilities of the band, who produced the album along with the help of Mark Ralph and Andy Smith. They create synth pop with funky dance floor beats and powerful pop anthems that my not be everyone’s cup of tea, however when we talk new music of 2015, Years & Years really have brought a new sound that Australia should be embrace. The bands latest single Shine is riding high in the iTunes charts and worth checking out. However we'd encourage your to really get on board and buy their debut album Communion on iTunes as any pop fan should and will love it..!